Tucked away on the 70th floor of the city’s renowned Swissôtel The Stamford, SKAI bar is set to take the most discerning of drink enthusiasts to new heights. A vibrant craft cocktail bar inspired by Mother Nature, the pioneering concept weaves organic elements into each detail, from the bespoke cocktail menu introducing four contrasting altitudes to the urban space featuring floor-to-ceiling panoramic city views. Helmed by Beverage Manager, Rusty Cerven, the thoughtfully curated programme will send imbibers on an experiential cocktail journey for thrill seekers and chill seekers alike. i am your regular customer. I am pretty much happy with your welcoming and service at your door step. Both myself and my girlfriend like the entire ambiance and atmosphere of your Bar. My suggestion for the upper floor to be closed for couples and they might want to spend some quite moments to talk or re-conciliate, for normal days. also Moments to Commemorate the Special events. The Lower floor to open to public and by reservation by appointments. I hope this will create a new direction and avenue for Skai for always being there to serve for your customers. Yours Sincerely and Satisfied Customer. Service was phenomenal, thanks for hosting our event. Our guests were very happy. Beautiful city views, great place to enjoy a drink and have a conversation. Great views and great service! Good service and great ambience. I had a lovely time with my partner. Extremely boring! Will NOTbe going again. There was no ambience. Hardly any music. No character or soul, terribly disappointed!! I didn’t mention in my reservation but it was actually to celebrate my significant other’s birthday. The view was awesome, cocktails were right on point, ambiance was great too when the sun sets. We would like to send our thanks and regards to both the (Korean?) hostess, Ms. Minhee and also bar manager Mr. Cerven. Ms. Minhee was really accommodating when I requested for a window seat, highly attentive to notice that we have finished the nuts and top it up without our asking. Mr. Cerven personally served us water and helped us to take exceptional photos by using his own phone’s flashlight. We truly appreciate such impeccable level of service on top of the cocktails and ambiance. Thank you and we would love to be back again soon! Relativ teure Getränke, aber für den Block lohnt sich das Geld. Sehr gutes Personal und eine vielfältige Getränkeauswahl. We tried 3 cocktails and all are so-so to not-so-good. Bar bites can be better and tastier. The ones we liked were the cauliflower tempura and chips. The wagyu skewers were cold and too chewy. Pork sliders were not tasty and the bun was dry. Service was slow. Although there was a little hiccup on the reservation list but the crew was patience to look for an available seating. The atmosphere was nice and cozy with lovely finger food. i was given credit card slip from another table. i assumed mine was mistakenly given to another table as well. Not good as this is a breach of personal data and information. Comme je n'ai savouré que les cocktails, je remplis le champ "gastronomie" uniquement parce qu'il est obligatoire. Good ambiance for talking over drinks while having a lovely view over the city. Service was excellent and prepared. The views are stunning - hardly to get anywhere else in Singapore. 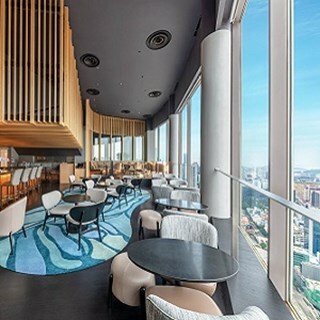 Great place to enjoy the stunning night cityscape of Singapore along with a glass of cocktail or wine and great company. Thanks for that evening. The birthday surprise for my friend on Sunday was perfect. You did it very well! We celebrated a birthday and it was such a wonderful experience! Members of the staff wished my guest Happy Birthday and we noticed they were attentive to all guests. When it comes to the drinks, we loved how much depth the cocktails had. And the staff wasn't joking when they told us we picked some of the stronger cocktails. We're bringing other friends back!